Two of SCC's Trustees Gill and Lynda volunteered in Cambodia for 10 months in 2006. One of their placements was at AFESIP's Siem Reap Centre. Here they met and worked with an AFESIP employee Bunhor a young man who was working his way through college. The little free time he had was dedicated to helping the women and children living in the Siem Reap Centre to learn English. Gill and Lynda assisted him in this task and they became increasingly impressed with his dedication to the residents and his determination to succeed on his own educational pathway. Bunhor's level of English was very advanced and he was primarily self taught. 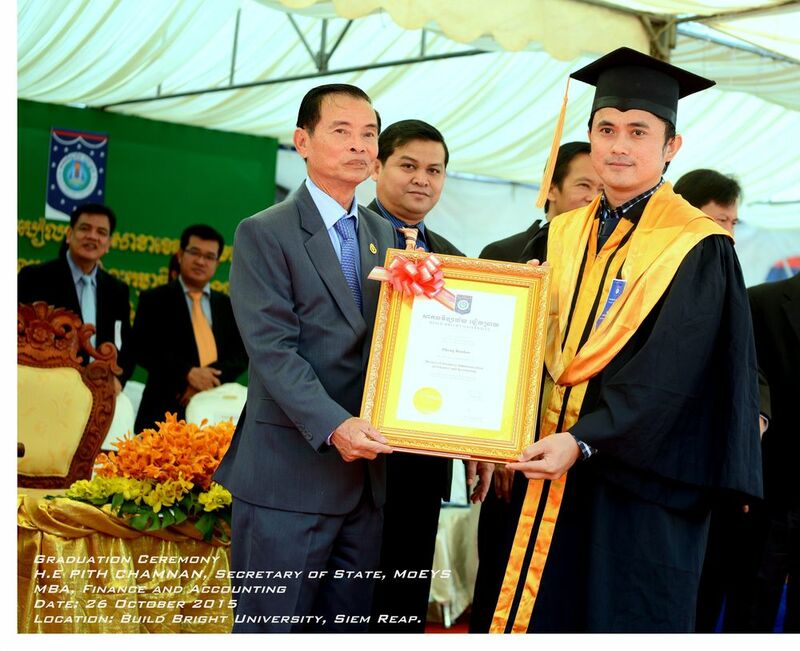 SCC have continued to monitor Bunhor's progress and are pleased to announce that he recently graduated with a Master's degree in Business Administration (MBA) specializing in Finance and Accountancy also attaining an Outstanding Student award. You are an inspiration to young people Bunhor. The dedication you have shown to your studies over many years has brought you the rewards you fully deserve. Although you have been intensely focused on your studies you have never forgotten your humanity and have continually helped others along the way. SCC know that some of the Siem Reap residents you taught went on to become teachers themselves. Good luck to you in your future career. You want to become a lecturer and you would be a first class asset to this profession.